Tom's Blog: Cena, puros, y vino! For those of you that don't like a good cigar once in a while or an upscale place here in Merida to get one this post will not be of any interest. Andrew and his lovely wife Elisa own Mercer Cigars here in Merida. Andrew's mom, Faye, and step dad, Vic, are some of our best friends. Going to Faye and Vic's is without a doubt one of the greatest pleasures anyone can have here in Merida. It is always a pleasure and they are super at making you feel at home and boy howdy the viddles are scrumptious! They are all great people and it's my pleasure knowing them and being able to call them my friends. Andrew came here with the idea of starting up an upscale cigar bar and made it happen and he did it in aces! Mercers was a pretty plush place to go. A very large walk in humidor and a selection of Cuban cigars second to none in the State of Yucatan. 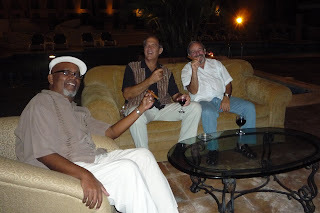 There are also cigars from other countries as well but the specialty there is Cuban cigars. Excellent liquor menu especially if you like to sip rum and single malts! Big screen tv with all the sporting events and the respectable amount of leather sofas and chairs to allow for a comfortable visit. Not to mention a fine air handling unit as well. So now if that isn't or should I say wasn't enough the entire place is undergoing a complete remodel to make it bigger and better. As I like to say, "if some is good, mo' is better!" Part of the reason for the remodel of Mercer Cigars has to do with becoming a "Certified Habanos Dealer". The "Habanos" Certification is very prestigious and highly coveted by those that have achieved the level of success and service necessary to obtain it. Ok, this may seem like a commercial but it isn't, and no I'm not getting a free cigar or anything! It's just when you come across something really good in Merida you have to share, right? Right! 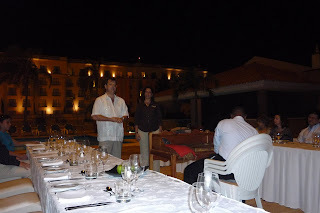 Anyway I want to tell you about the first Mercers sponsored dinner and cigar event at the Hyatt. 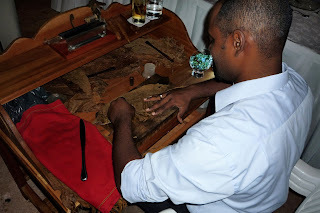 Mercers has various events throughout the year and Andrew decided that since he was bringing in a world famous Cuban cigar roller from the prestigious Partagas Company that he might as well make a special event out of it. 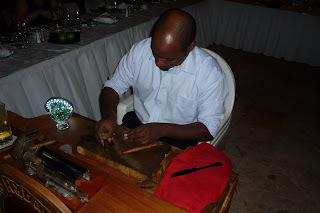 Andrew combined a demonstration by the roller using tobacco leaves from Cuba. 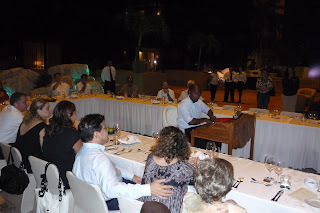 Each participant could watch the cigars being rolled right there and each participant received one of the cigars. In addition was a fantastic meal with appetizer, filete mignon, and dessert. Moving right along I'll tell you about the fantastic duo that performed while we ate. 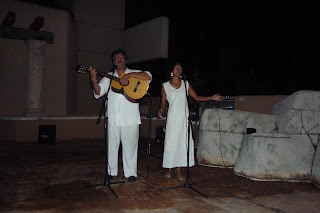 They are from the Merida area and they were just another added ingredient to make the night perfect! Last, and yes there is more, Andrew got together with the folks from Covi and the vino it did flow! 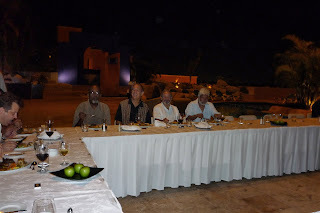 We were greated with a glass of wine as we arrived and with each course a different wine was served. The wine pairings were superb! With the last wine being a port style malbec served as the cigars were being handed out. I and the guys I was with moved over to the cushy terrace seating and settled in for conversation, a great vino and an ultrafine cigar! Oh, and the setting was out under the stars on the Hyatt's third floor pool terrace. This is Andrew making his opening remarks and welcomed us to the first Mercer dinner and cigar event. After a few more introductions including Richard, the manager of the Hyatt, Andrew, introduced the torcedor and the fun began. The torcedor was there for us to watch and watch I did. cigars! It was really a treat to see this guy do his thing! Every one had a good seat to see him! We had a great time and the music was superb! Vic, Doug, and I had a most excellent time! Hey, Tom! I'll be down in a couple of weeks. Grab Debi and let's smoke a stogie. The only time I've ever been in Mercers was right after it opened. Loved my cigar! Hi Josh, Sorry for being so slow but regardless it'll be great to get together and go to Mercer's and have some single malts and a nice puro! Just a quick update to my post. The name of the shop here in Merida is now La Casa de Habano and not Mercer's. The name Mercer's will now be used for mail orders only.